So I've decided not to continue with my book club next year and for scheduling reasons I am not able to attend the last two books of this year. I am kind of sad about it just because I hate change but it was also my own decision. So now instead of posting about my book club books I will be posting about other books I am reading on my own. 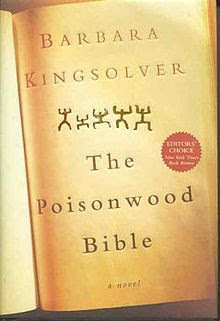 This past weekend I finished The Poisonwood Bible by Barbara Kingsolver This is one of my favourite books and I wanted something familiar to read. I started it during the Labour Day weekend so it took me awhile to get through it, but it was just as good as I remembered it. I don't like giving spoilers but I will give you a brief plot summary. This is a story about a Baptist minister who goes to the Belgian Congo in 1959 shortly before it declared its independence. He had a wife and four daughters and a strong will to spread God's word to the people of Kilanga. The story is told through the eyes of the women in the story. I always like reading from different points of view, it keeps the story moving along. If you are a student of history you can probably guess that the declaration of independence of an African nation from its European rulers was not a good place for a white American missionary family to be. When you pair this with the minister's stubbornness, there will be trouble. I won't say much more because it is better to just read the book and find out what happens, but the underlying doom is there throughout. Because the daughters are all so different, you can get a fuller snapshot of the situation. Rachel is an entitled 16 year old, Leah and Adah are twins, but different. Leah is her father's daughter, and Adah reads things backwards, sees poetry in everything, and doesn't speak. Ruth May is the baby of the family, and although innocent, provides insightful commentary. The mother is telling the story as she looks back on the past, whereas the daughters are more or less writing in the present tense, although with some reflection. Although this is a work of fiction, the historical events are true so you can read the Wikipedia pages about what happened there. It is because of this book I have always been very reluctant to support Christian missionaries. I'm sure some of them meant well and did good work, but I would think most of them did more harm than good. There is one passage in the book that I have marked (it's the start of Leah's passage in Book Six) that I love. It's the thing that I always love about books and movies; a description of how things used to be and how it could have been. It's the type of thing that really breaks your heart because you know how the story turns out. That is sort of hard to explain but if you know the book and read that passage, maybe you'll understand what I mean. So if you have not read this book, get a copy. I think many people would enjoy it. Recommendations for other books welcome please! I'm hoping to put together a rough schedule for my own reading for this next year.